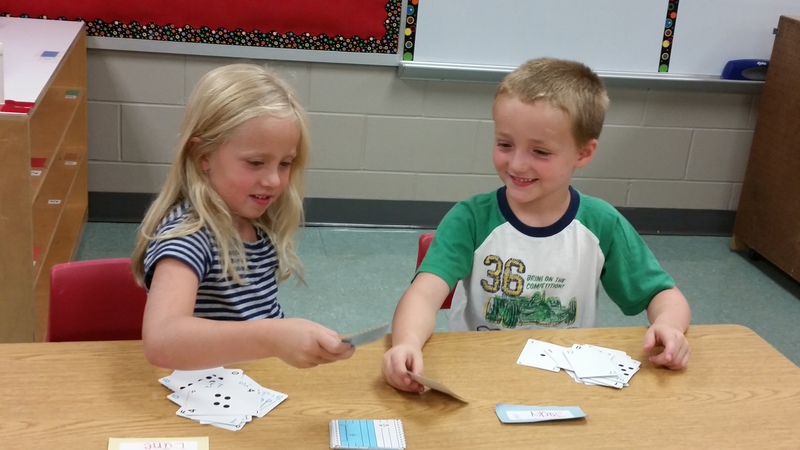 So on Thursday while working with my Lake Mills Kindergartners at the summer school, I learned a super easy game called “Top It” (or in other words, the little-kid version of the card game War). How to play: Shuffle the deck and each person picks a card from the top. The highest card wins and takes both cards (object of the game is to have the most cards at the end!) If it’s a tie, then you do the same thing again, pick new cards, and whoever wins the tie-breaker takes the entire tie pile. This game sounds super simple, but for five-year-olds it’s awesome because it helps them to practice counting, learn numbers and quantities, and have fun, too! I suggest it for small-aged kids–easy, but a great learning tool! < Make it Through the First Week of Kindergarten – Check!